The camellias are garden flowers, and are very showy. If you cannot find camellias, alternatively, you can use peonies or garden roses with lemon leaf to green the vase. These tend to be on the more expensive side. So, if you're looking to add more adventure to your life, you can thieve them from your neighbors' yards. The proportions in this arrangement follow the Greek rule of the "Golden Mean," a ratio of 1/3 to 2/3rds. The cranberries take up the top 1/3 of the vase and the bottom 2/3rds of the vase are taken up by clear water. Okay, now that we've talked about thievery and math, let's get to work. The cranberries take up about 1/3 of the vase. This is an oval vase. It looks kind of like a flattened fishbowl. Fill your vase with two 12 ounce bags of fresh cranberries. Add bag #2 of cranberries. Add cold water to 1.5 inches below the top of the vase. 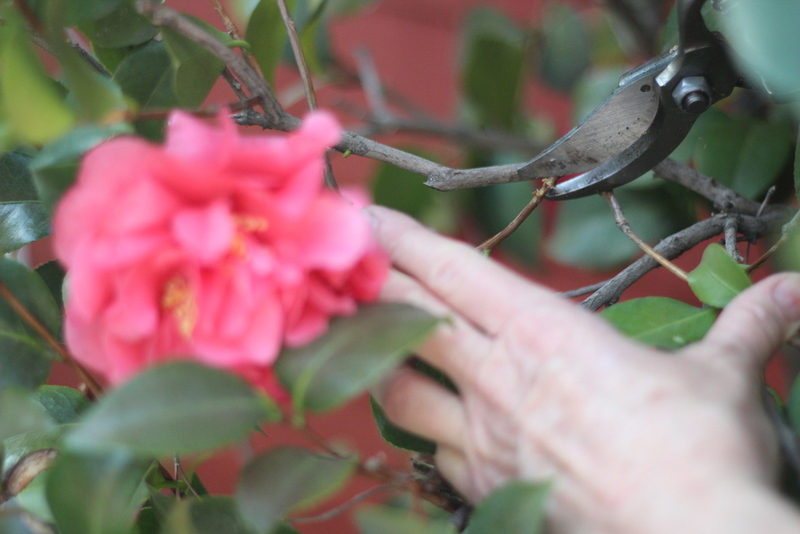 Ttry to cut blooms that have long stems. (5+ inches). Remove leaves below water line because they will rot too quickly. Leaves above the water line should be left attached to add more color. If stem's too short, leave it on branch it's growing from & trim. Cut 10 -12 blooms and 3-4 stems of leaves. Wash and dry leaves. Don't get the blooms wet though! Place two stems with leaves extending. Add remaining stems. If stem droops, wire bloom to another branch. Add the blooms to give it the fullest look possible. Finish front & back. Check no stems are below cranberries. Add linen ribbon for a nice finishing touch.